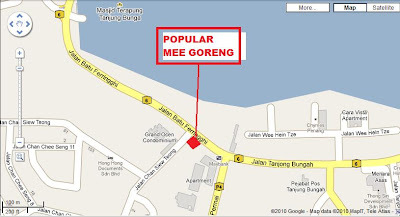 The popular Mee Goreng is located infront of Chuan Foong Coffee Shop at Jalan Chan Siew Teong, Tg Bungah, Penang. 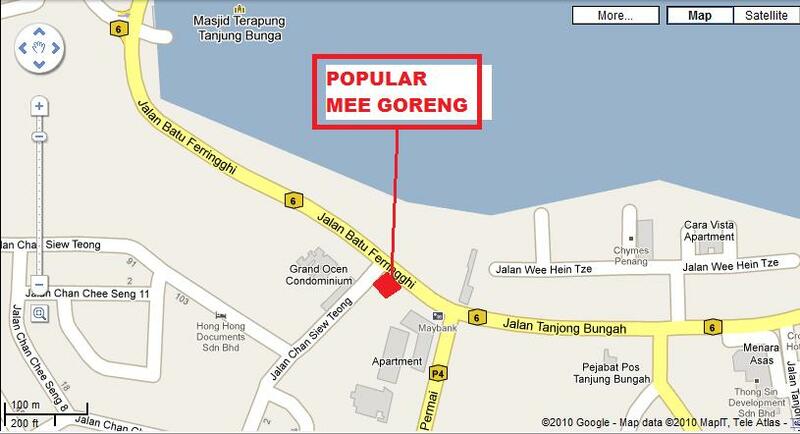 This popular Mee Goreng was formerly located near the Bus Stop infront of the Sin Hin Keng Restaurant. It has been operating the business for more than 30 years. In old days, a group of friends and I used to go swimming or camping during the weekends and school holidays and always patronized the Mee Goreng before we continued our journey. We sat on our bicyles to enjoy the Mee Goreng. There was no tables or chairs available. A long bench was provided for the customers to sit on. RM3.50 per Plate of Mee Rebus + Egg. RM3.50 per Plate of Mee Goreng + Egg. Business Hours : Afternoon until Evening. No. 01 : View of Chuan Foong Coffee Shop at the Junction of Jalan Chan Siew Teong & Jalan Tg Bungah, Penang. No. 02 : View of the Mee Goreng Stall infront of Chuan Foong Coffee Shop. No. 03 : Hohohohoho !!! He was a not camera shy. If you love the Mee Gerong @ Bangkok Lane, I bet that you love this one too.